Hello and happy Wednesday! Just want to say a quick thank you for all the great responses and tips on my pre-washing post. I normally respond (or try to) via email, individually, but it seemed like it could be relevant for future readers, to keep the “conversation” going so I decided to reply directly in the comments section. Just FYI! You guys are great and I appreciate your thoughts!!! So… *deep sigh* I’m on week two with one of my girls home with this nasty flu. Yes, it would have much more effecient for them to be sick on the same week, but of course that was entirely out of my control. Unfortunately, I’m not feeling so great myself this time around! So a lot of tea has been made and noses blown, but this is one of those doozies of a flu, where the best medicine is just having mom right by your side and time to ride it out…… I cherish and accept!! What that means however, is that not a lot has been accomplished the old sewing room! I did get a design vision though and realized that my Oakshott cottons would be so perfect for it. 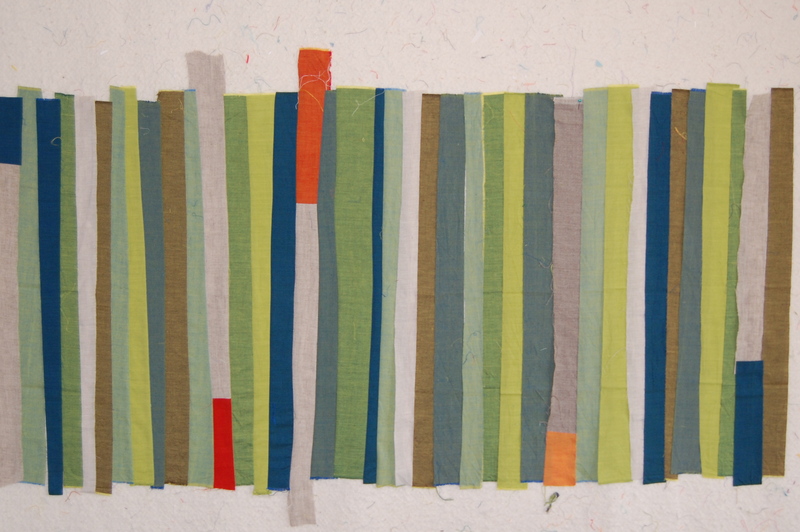 I also added some of my various shade and weights of scrappy linen. So far this is only partially sewn together as I’m still playing around with placement and color flow. I love this part!!! For now I’ll have to let you consider what I may do with this giant strip block. To be continued……..
I’m linking up to Lee’s WIP Wednesday!! Hope your day/eve is spectacular! Flu is the worst! I hope everyone recovers/doesn’t catch it. By the way–there is a wordpress plugin that emails your replies to comments to the commenter… you may already have that but I thought it sounded like the best of both worlds. I’m glad the germs are headed that way instead of over here (and yes, I did just knock on wood even though I know logically it doesn’t do any good). Kids and their germs. *sigh* I like the collection of fabrics so far! Those colours are beautiful and I really like the improv strips. Hope you are all better soon. I helped a friend who avoids prewashing make a number of sawtooth stars and was so surprised to find that spraying the larger than 10 inch square pieces with water and pressing each scrap was such a pain. I needed to remove the distortion of the huge scrap bag of crumpled up and oddly folded pieces to get decent 2-1/2″ and 4″ squares. I longed for my own stash, all washed, pressed, and ready to go where I grab a bunch, layer them, and cut away. I guess prewashing depends on how much of a scrappy quilt top one is making. Never will work with someone’s scrap bag again. Too much distortion. Too many undesireable creases and unnecessary folds. I wanted to get on with the sewing and finish the cutting fast. I need accurate pieces to make sewing my blocks a quick and easy process. For me, good blocks fit together for a flat quilt top.